If you’re new to boxing and not sure exactly what you need to do then it’s important you make sure you’re as safe as possible while training. Boxing handwraps will protect you and your partner while training. Allowing you to hit harder without worrying about injuring your hands. In this blog, I will be taking you through two things. Why handwraps are so important and what makes a good pair. Hopefully, this will help you to choose your own and stay safe. Firstly, it is recommended that handwraps are worn for both bag work and sparring with a partner. This is to protect your hands and wrists against injuries which are caused by punching. And as you can imagine there’s a lot of that in boxing. Repeatedly, hitting a bag or jabbing a partner will eventually cause injury so the wraps are there to help minimise this. It’s not just a good idea to wear them during a fight but it’s necessary. Officials are required to check that handwraps are being worn by both fighters before a fight starts in order to protect the boxers. If you don’t want to wear them then you will not be allowed to fight. And I’m not talking about getting matching colours here. If you are planning on buying a pair of boxing gloves, then make sure you try the gloves on with your wraps. This is so you can see how the gloves fit while you are wearing your handwraps. You need to make sure the gloves are not too tight or loose with your wraps. If you are not sure what gloves you should be buying then why not take a look at our guide here to find out what will be best for you. So now that you know why wraps are important we will get into what makes a good pair. An important part of this is making sure you have good quality hand wraps. And that they’re the right ones for you. If you opt for a cheaper pair then they will not provide you with the level of protection that you need. You want to find some which have a think enough material to provide adequate padding for your training. Just like the Hayabusa ones below. Click here to have a look at them. 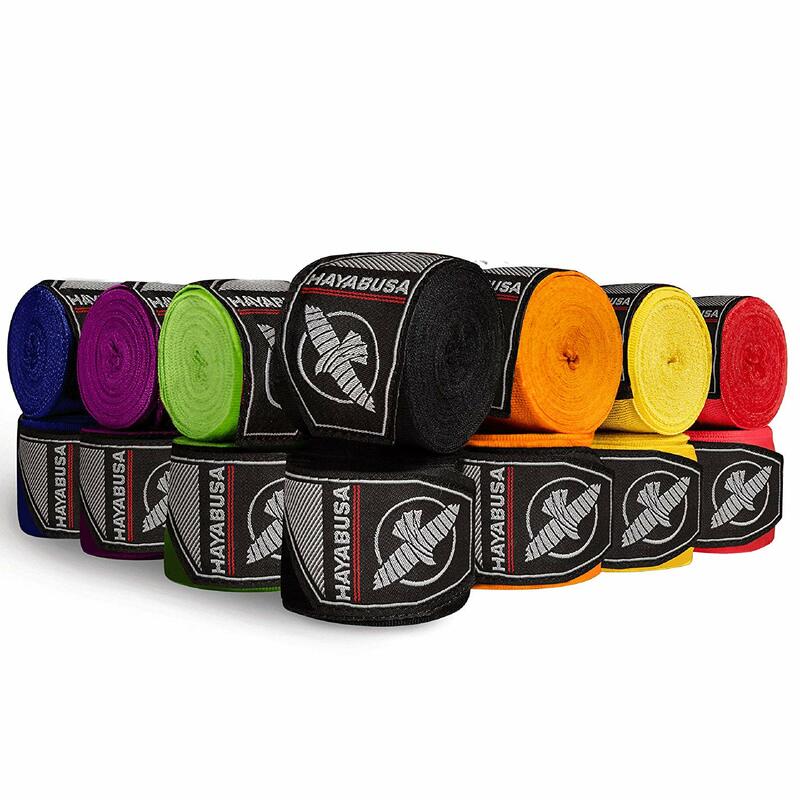 The new Hayabusa handwraps which you can find here, offer maximum protection. They have been designed with an innovative material which helps conform to your hand and aligns your hand and wrist. These high-performance wraps will protect the many small joints, bones and tendons from repeated impact during training. They also offer a hook & loop closure system which is 71% longer than rivals which ensures a superior and secure fit every time you train. This is to stop your wraps from coming undone during training. Which can cause them to loosen around your hand and therefore not offer you the best protection which can lead to injury! Another important aspect of great handwraps in their style. There are two main styles, traditional and Mexican. Traditional handwraps are made from cotton alone and have been around the longest. They do provide you with a tighter fit but do not stretch. This is why they have been replaced by the more popular Mexican style wraps. Mexican handwraps are a more modern version which is a blend of spandex and semi-elastic cotton. Mexican will always be the best option and they are a more comfortable choice as well. You will want to make sure your handwraps are long enough. Any wrap under 180″ won’t give you the necessary support and protection that you need and it is wise to stay away from anything less. Some children or people who have smaller hands may look for a shorter wrap and 120″ is popular for kids but the longer the wrap the more padding you will have and the safer you will be. What’s the point in buying a great pair of hand wraps unless you know how to put them on. How you wrap your hands, is just as important as buying a good pair. You could have the best handwraps in the world but unless you know how to put them on properly you are risking injury. So click here to see our guide on how to properly put your wraps on. There are several different ways to wrap your hands but any variations from the ones we have just shown you will be fine. Remember to try and cover all of your hand with an even layer of material. So now that you have all the information it’s time to go out and get you handwraps. Remember the important bits though. Mexican over traditional. Nothing under 180″ long. Look for something with a long and secure hook & loop closure system. And make sure you try them on with your gloves before you buy anything.